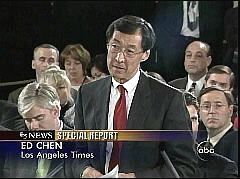 The current President of the White House Correspondents' Association (WHCA), Ed Chen - who instituted the silliness of having the organization buy carbon credits to offset the travel of this year's dinner headliner, Jay Leno, as well as for the President's motorcade (seriously) - is leaving Bloomberg News to lend his shallow liberal advocacy to the left-wing Natural Resources Defense Council (NRDC). In an e-mail to the Politico's Mike Allen, Chen trumpeted that at the NRDC he will be able to perform "the Lord's work" and that he wants to "help public officials find the wisdom and courage to do the right thing to combat climate change before it's too late." My regret over leaving one of the world's largest - and certainly the most ambitious - news organizations is offset by a sense of urgency in resuming doing the Lord's work, particularly after the BP oil spill. That debacle was a divine signal to redouble my efforts to help clean up the environment, help America kick its petroleum addiction, and help public officials find the wisdom and courage to do the right thing to combat climate change before it's too late. So, I'm returning to the Natural Resources Defense Council (in Washington), soon to be reachable at: EChen(at)nrdc.org. Picking up on the Politico's post for a Monday night "Grapevine" item, the FNC's Bret Baier quoted how Politico grasped the obvious, that this latest move "will likely reinforce notions...that all journalists are biased and largely towards Democratic-friendly organizations." June 10: "After Two Years with Obama, Linda Douglass Returns to News Media"
Bloomberg's Ed Chen is leaving journalism to join the Natural Resources Defense Council, telling Politico the oil spill prompted his decision to resume doing what he called the "Lord's work" in fighting climate change. Politico noted that it, too, has struggled with the revolving door. Politico reporter Jonathan Alan left for a short time to work for a Democratic Congresswoman [Wasserman-Schultz] and had said before returning to Politico quote, "I'm hopeful I can advance the Democratic Party's goals and obviously the Congresswoman's goals." -- Brent Baker is Vice President for Research and Publications at the Media Research Center. Click here to follow him on Twitter.